DALLAS—Six Texas high school football stars have been recognized in the eighth week of the 2017 Built Ford Tough Texas High School Football Player of the Week program. Among the North Texas standouts is Bishop Dunne Wide Receiver Marquez Beason, Jr. 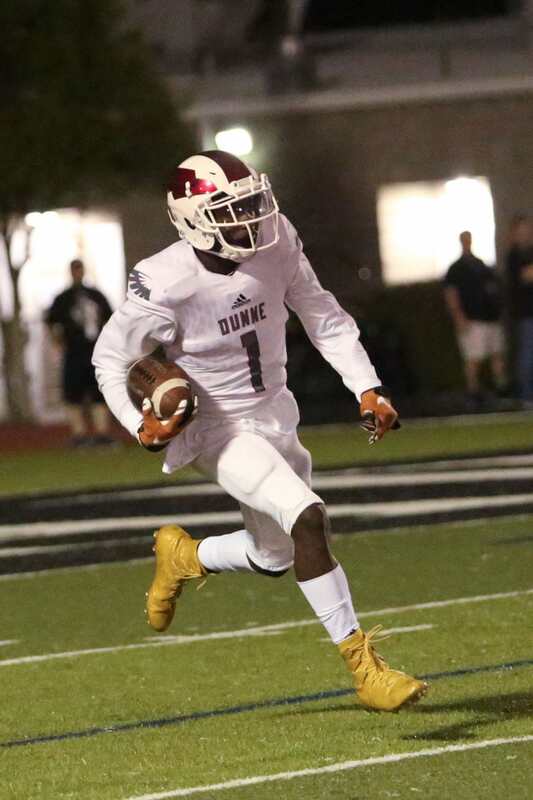 If you think you’re watching someone special when you see wide receiver Marquez Beason light it up for Dallas Bishop Dunne, you’re not alone. The staffs at Texas, Oklahoma, A&M, Georgia, and LSU, among a lot of others, fully agree. More than 30 of the nation’s powerhouses have already offered the 5-11, 175-pound wideout—and he’s only a junior, folks. In last week’s key TAPPS District I-1 match-up with Parish Episcopal, Beason got the job done at both ends of the pass. He had two huge touchdown receptions for 38 and 19 yards and he tossed a scoring pass to his sophomore cousin Zeriah as the Falcons sprinted off to a 49-3 halftime lead on the way to a 56-17 victory. And for good measure Marquez carried the ball five times for another 19 yards. For the season, Marquez has now rushed 24 times for 301 yards (12.5 a pop) and four touchdowns and he has 22 receptions for 374 yards and six TDs. Blessed with 4.3 speed, Marquez will play an even bigger role as Falcons face arguably the toughest district in all of TAPPS play. Semi-finalists for the state crown in 2016, Dunne looks to take the next step in ’17. In its twelfth consecutive year, Ford Motor Company’s Player of the Week program is again honoring six outstanding student-athletes each week of the 2017 regular season, recognizing one player in each of the state’s six athletic classifications. The winners boast not only their athletic achievements on the field, but outstanding scholarship and community involvement as well. These players are the embodiment of Ford’s Go Further commitment. Owner of a solid B academic average, Marquez takes full advantage of his speed in track. He’s the two-time state 100-meter champion and is one-fourth of a 4 x 100 relay team which set a world age-group (16) record. •Fans, coaches and media can nominate athletes at PlayeroftheWeek.com, as well as catch up with winners, view video clips of players in action and get the latest program details. The half-hour Built Ford Tough Texas High School Football Player of the Week program airs Saturdays at 8:30 a.m.